Books, blogs, and many magazine articles have been written about the tools and equipment needed by horse owners. Minimalists go with the very basics, but other horse owners fill their barns and tack rooms with all kinds of tools, some of which they never use. Your first aid kit should include wound dressings, antiseptic solution, bandages, scissors, surgical and duct tape, leg wraps, ointment, tweezers, Q-tips, spray bottles, towels for applying pressure to slow or stop bleeding, a clean bucket, and your veterinarians phone number for use in case of emergency. 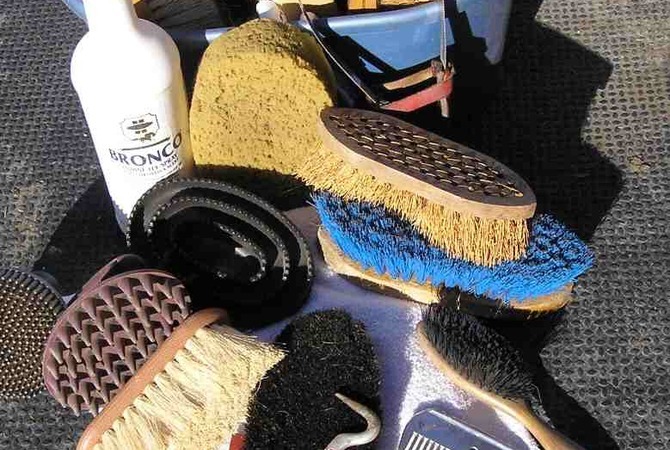 Necessary grooming supplies include a curry comb, stiff and soft brushes, a soft cloth, mane and tail brush,,shedding blade, hoof pick, and a hoof brush. A weight tape comes in handy when you want to quickly estimate your horse's weight. Weight tapes are available at feed and tack stores. If a commercial weight tape isn't available, you can use an ordinary measuring tape and consult a horse's weight table following the directions given in the table. A variety of commercial heart monitors are available to measure fitness, well being and sports performance. Although not absolutely necessary, they help keep track of a horse's fitness. Heart monitors are accurate, reliable and easy to use during rest, exercise, and recovery. Every responsible horse owner needs to be able to check a horse's vital signs at a moment's notice. Supplies you will need include a rectal thermometer (digital or bulb), for taking temperature; K-Y Jelly or other water-based jelly for easy insertion; a stethoscope, although not absolutely necessary a stethoscope can come in handy when checking a horse's pulse, respiration rate, and also for checking for gut sounds in cases of colic and other conditions. One of the keys to good horse health is a regularly scheduled deworming program that is followed year in and year out. Working with your veterinarian you should establish the worming program and environmental control practices that will work best for your horse. Once your program is established, it is important to keep a supply of the necessary dewormers in your barn or tack room to be used on schedule following the directions given by your veterinarian. In some cases, you may depend on your veterinarian to vaccinate your horse, but you may also want to do at least some of the vaccinations yourself following the directions of your vet. Because your horse needs periodic booster shots in many cases, as well as other shots, having syringes and other supplies available to administer vaccines can help ensure that your horse receives needed immunizations and booster shots in a timely fashion. Making sure the vaccines you use are not out-dated and are administered in the correct dosage via the correct route, either intravenous or intramuscular, or in some cases, orally is very important. Always listen to and follow your veterinarians advice when using medications or prescriptions. Common oral medications include anti-inflammatories and antibiotics, along with NSAIDs and other commonly prescribed drugs and treatments. If your horse needs daily injections or medications, your veterinarian can show you how to do the injections or how to get the horse to swallow oral medications. EquiMed staff writers team up to provide articles that require periodic updates based on evolving methods of equine healthcare. Compendia articles, core healthcare topics and more are written and updated as a group effort. Our review process includes an important veterinarian review, helping to assure the content is consistent with the latest understanding from a medical professional.